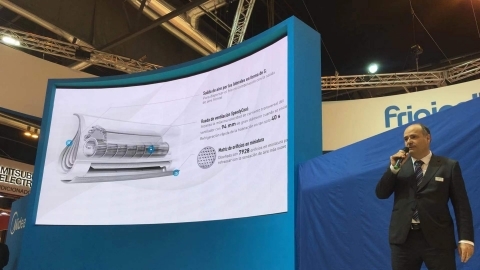 Midea unveiled its latest flagship product BreezeleSS+ at Climatización & Refrigeración. BreezeleSS+ is the air conditioner that offers the highest level of air comfort and meanwhile has a comprehensive performance in all aspects of Speed, Soft, Surround, Silence, Saving and Smart. Midea has clearly positioned the all-new BreezeleSS+ as the one for those who demand the real comfort. It is exclusively designed for Europe and will be launched to public in the coming June. C&R is one of the leading trade fairs for air-conditioning, ventilation, cooling and heating technology in Europe, which is taking place at IFEMA from 26 February 2019 to 1 March 2019. Midea as one of the leading brands in the industry launches several new air treatment solutions and technologies that has caught much attention, especially the brand-new species split air-conditioner, BreezeleSS+. BreezeleSS+ is the first air conditioner designed for the highest-level of air comfort which features the “BreezeleSS+ Tech System.” The all-new fast cooling experience, for its air-outlet temperature can drop to 23 Celsius within 40s, and also decrease the room temperature with one minute. With the extraordinary 70mm full-width opening angle of the air outlet at the front and turbo-speed operation of the cross-flow fan wheel, the coolness can be quickly generated and spread to fulfill the room shortly. Each BreezeleSS+ is equipped with Midea’s exclusive “TwinFlap™”, a twin deflector structure with of 7928 mini-holes, allowing the air conditioner to direct and tenderly disperse the coolness. The mini-holes are designed in different directions and sizes to instantly soften and disperse the cool airflow, exempting from the manual adjustment and water condensation. The BreezeleSS+ also provides the 360° surrounding technology for even and rapid cooling, owing to the exclusively designed S-Winged Side Air-outlet. With the continuous innovating and pursuit for the best user experience, BreezeleSS+ redefines the high-tech air conditioning with humanistic concern. It’s a revolutionary immersive cooling experience that frees people from getting cold, aches because of the stiff and strong wind draft that used to be seen inevitable, bring a sensation that truly satisfies, just like Zephyr, the most favorable wind god.